I took $2000 of some money I got back from my school and felt the timing was ripe to trade some stock options. During this time I was deep into renovation a rental home and in full force finishing my MLitt in Film Studies dissertation project and essay. This was hardly the time to be trading volatile stock options on large cap stocks that move violently day to day. My main goal was to just earn enough to pay back, well everything, my total debt is around $130,000. I’m not afraid to say it. Most people hide it, but I hide nothing. I’m not proud of it but sometimes you make bad mistake after bad mistake or in my case I just consider myself likely somewhat handicapped in the entrepreneurial department. I would go as far as thinking I am mentally and business retarded at times making irrational decisions to achieve my American Dream – which now I know is definitely not greed for money but greed for personal freedom/desires (Which still cost money). So here I am with $2000 to basically lose even though I need it for repair costs, credit card bills, yada yada. I see a great trade on Priceline Inc (PCLN) when I see it got crushed after a report on possible lower revenues. This stock has a solid cash balance sheet and great EPS/PE. I bought it around $559. I have been trading CALLS on it ever since and have done pretty well. Every time I get in it my main goal is to be out of it within 24 hours or less. For the most part I have achieved this. The other trade is with Apple Inc. (AAPL). I’ve traded some PUTS and CALLS on it. They have been mostly quicker trades the PCLN. For the most part if I wanted to I could be in and out of AAPL within 2-4 hours earning on average $500-1000. My last trade earned me around $3000. I’ve only done I believe 5 trades in the past 30 days. This is inline with Gary Williams trading rules to only trade 5-10 times per month maximum. I’m taking a break now so I can let my run cool and re-focus on my next trades. I am not as eager to trade as when I was 23-29 years old and I think that is because I am wiser at trading more now at 31 then when I began at a young 18. I almost took my $7000 profit to buy a sweet badass 1965 mustang, but instead I settled for an ever cooler 1990 Bronco with a failing engine for $900 which I didn’t have to pull any money out of my trading account. Hahaha. Come on, just laugh! The back top comes off and it turns into a muscle jeep. My mom owns my loved diesel Jetta and I hope to get it back or just buy myself one once I have a more stable income. Currently I’m finishing my MBA, working on starting a mini aquaponics fish farm, trading options again, and among all this trying to now edit my first non-fiction book with a friend to publish and sell on all digital readers. So, I don’t know what my future of trading holds for me, but I do know I’m on a good run and I don’t want to give it up so easily. Oh, if you are wondering about the Toke n’ Toss business ventures, well, it’s completely over. Now I understand why they say choose your partners wisely – marriage or business. Let’s just say this was another $5000 business lesson, but this lesson was one on one truck/stand vending for concert goers. Learned a lot, but learned the most that people that aren’t willing to budget and chip in on expenses should be left on the side of the highway as soon as they start complaining that a twelve pack of beer IS a business expense and YOU are going to pay for it because the partner doesn’t have any money. In my previous post after the continue trending change in AAPL, GOOG, and PCLN I see them moving down further. News articles have already come up to scare off Apple investors. A bounce back from its previous sharp fall is normal. We’ll truly know a peak has been hit if AAPL big +30pt move dies by the end of the week. However, practicing these 3 helped me pick out the weakest of the litter – Google. Google has been moving like a slug in the crowd and falling harder when taking hits. For this reason out of my 3 practice trades I would trade my life on I would choose Google put options. I intuitively feel it has the most loose too because it has tried so hard to become everything and take over large markets. It is still a search engine and advertising engine, but it’s beginning to spread itself thinner and get into more trouble. Also it doesn’t really MAKE anything. Everything is digital even though it did buy Motorola it sounds just like to make them stronger instead of actually innovating a product line with a whole lot of money. 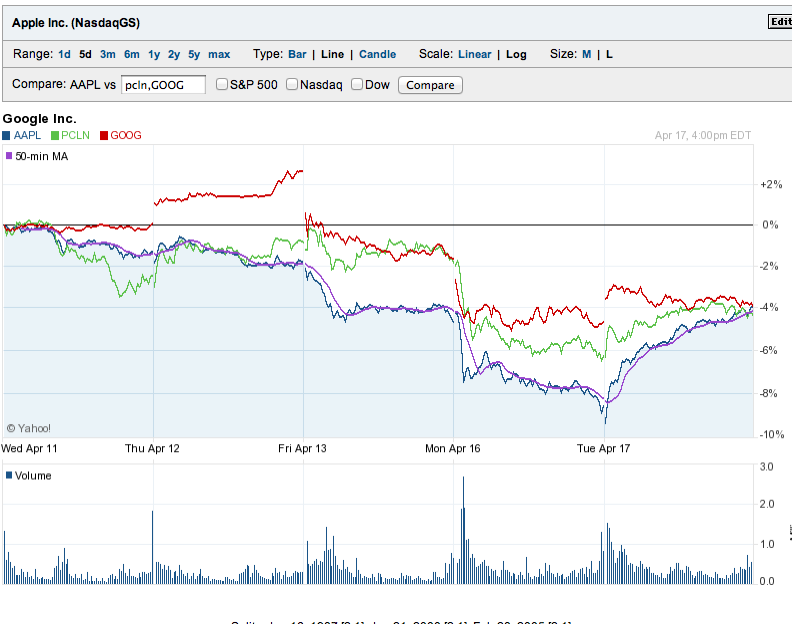 See chart below – As you can see GOOG moved the least with it’s friends. My current practice options must be down at least -80% but that’s okay because I’m smart to be practicing my theories instead of using real money like I use to. My expected bounce back on Apple that I knew was going to happen but could’t confirm did happen today. For the most part if a stock takes such a big dive, it’s still worth tons in free cash, and it’s a top tier company it DOES bounce back however from YEARS of watching the market if it is at a super high run up peak if it isn’t able to recapture it’s highs investors and big traders start considering to make million$ trading the other way down because ladies and gentleman you can earn just as much as not more shorting or put options on a stock – some awesome instrumental tools as a knowledgeable trader. It’s too bad Yahoo! Fantasy Finance doesn’t let you short or trade options on stocks in your portfolio. I’m currently up 14%. Nothing to brag about compared to leaders supposedly with up to 150% gains in the past 30 days. I don’t know how they are doing it but I can only assume they are trading penny stocks or stocks only under $2. Some BIG OPTION PLAYS I’d trade my life on which I think at the moment are definite risk/reward worthy are put option trades on AAPL, GOOG, and PCLN. They have been trending down for the week 5-20% off their highs. I’ve been waiting and waiting for some big institutional sellers/investors to start taking some profits and selling. I believe this is finally happening as stock analysts re-think Apple. I think it’s run up with Google and Priceline are currently in a stock value correction. The company’s have moved up so quickly a stock correction was bound to happen. Now I’d trade my life on a definite ongoing correction probably another 10%. However, from experience, this could also be a quick buying/selling opportunity. Whenever a high talked about stock like Apple falls 20 points as it did today then next morning it can have a volatile swing upwards confusing any type of trader. So a correct entry point is crucial and very short-term trading profits are important – meaning if I was going to trade puts on any of these companies once I’m up 50-100% in a day on a contract it would be smartest to get out and just get in/out when the timing looks right on technical charts and watch how investors are reacting/how news is changing. Even with the stocks hit hard today I can bet they will actually be positive tomorrow. 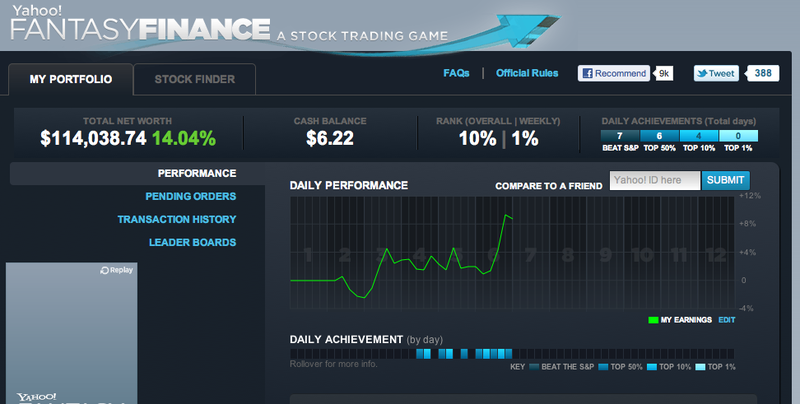 However I feel a put trade over 1 month will have definite positive results. Since I have no money in my account. I will trade as if I only have $2000 for each option. (A total of a $6000 account). Here are my 3 BIG OPTION PRACTICE PLAYS on AAPL, GOOG, PCLN. AAPL 555 MAY PUT @ $20.44 (This is the closest to in-the-money I can buy – although way out of the money with only having $2k towards trade however this option is moving fast with big swings). Very short-term such as the next 1-2 days I expect the stocks to pop up, however if I’m right on trending and more importantly – FEAR of losing money for many holders – the stocks should continue a down trend and the more that sell the sharper the decline until a big guy steps in and stops it buying back changing direction – a new market correction. So check back in a week for a post update on this practice trade.